甘肃省) . The garden covers an area of 1.45 hectares (3.58 acres) and is comprised of two waterwheels, a cofferdam, the recreation area and a house of water mill. It is certainly an exciting experience for the visitors to tour around the Waterwheel Garden, a restoration of the ancient irrigation system. It occupies an area of 14,500 square meters, consisting of a huge double-wheeled waterwheel, a cofferdam, a water mill and amenities. 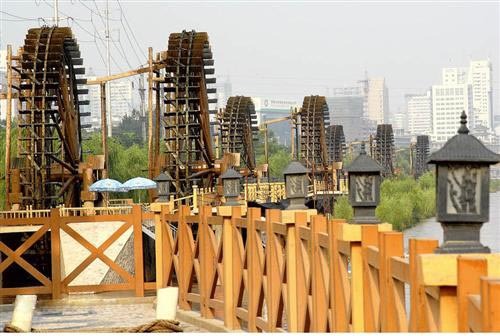 Giant ancient waterwheels, made in the Ming Dynasty, were used for irrigation of the farming fields along the Yellow River in ancient Lanzhou City. 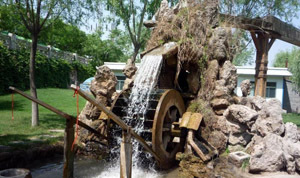 The Lanzhou waterwheel was quite a famous invention of ancient China, and it was named "Heaven Wheel", "Fan Wheel", "Irrigative Wheel" and "Tiger Wheel" at different times of the history. Hence the Waterwheel Garden was built to honor the invention of this ancient irrigation instrument. 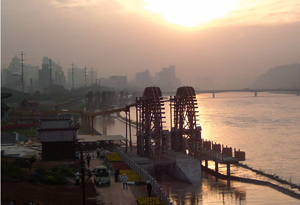 Lanzhou is the only city through which the Yellow River flows; there are thus many irrigation machines in the city. 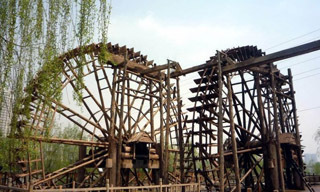 The waterwheel invented by Duan Xu in the Ming Dynasty (1368-1644) is the oldest one. Duan Xu learnt from the irrigation machines in Yunnan Province and invented a distinctive style with the appearance of chariot wheels and a diameter ranging from 10 to 20 meters (32.8 to 65.6 feet). The center of the wheel was placed with an axle and boards, while the brim of the wheel was fixed with many quadrate buckets. These buckets could carry water to a height of 15 to 18 meters (49 to 59 feet) in order to irrigate fields. 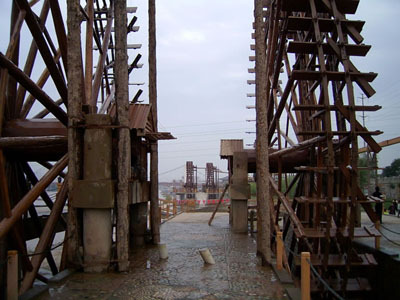 Until 1952, about 252 waterwheels stood along the river in Lanzhou, and at that time, the city was reputed to be the 'City of Waterwheels'. A typical waterwheel has a diameter of 16.5 meters. During the flooding season, it would sit on the southern bank of the Yellow River trundled by the flowing river. Other times of the year, water stored in the cofferdam in canals would be used to push the waterwheel. The theory of waterwheel is incredibly simple but smart: a number of water baskets are attached around the outer bound of the waterwheel; the water comes in from one side of the waterwheel; once filled with water, gravity together with the added weight of the baskets will turn the wheel and keep it rolling; the basket will empty itself and fill the wooden trough once it has passed the top of the waterwheel; the empty baskets will take more water while the trough will deliver the water for irrigation; and the process continues. Location: No. 524, Binhe East Road in Lanzhou, Gansu Province. 1. As the landscape of the water, the Waterwheel Garden is prefered to be visited in warm days. The best season is in July while in the cold winter and the windy spring it is not recommended. Actually, the Waterwheel Garden is more like a museum than a garden. If you want to have a good look at the real ancient waterwheel, Shatoupo is a good place. 2. In the garden, tourists can experience crossing the river on a sheepskin raft, which is the most primeval ferrying tool in the northwest region of the Yellow River. A visit to the Waterwheel Garden will provide an insight into the irrigation tools of ancient times.